YAKIMA -- State Fish and Wildlife biologists and wolf experts from Idaho captured what they believe are two wolves Friday in western Okanogan County, a development that could confirm the first wolf pack in Washington since the animals were eradicated decades ago. The biologists fitted both animals with radio collars to track their movements and learn more about them. They also took fur samples for DNA testing to confirm that the animals are not hybrids, state Fish and Wildlife spokeswoman Madonna Luers said. However, one of the wolves was a lactating female nursing pups, Luers said, and domesticated hybrid animals are not known to reproduce in the wild. "We're always cautious," Luers said. "But if we do get results back and they show these are actual wolves, this will be solid confirmation of Washington's first resident wolf pack since the species disappeared from the state in the 1930s." Test results are expected in a couple of weeks. After being hunted to near-extinction and listed as an endangered species in 1974, gray wolves were reintroduced to the northern Rockies in the mid-1990s. They thrived, and the wolves in that region were removed from the endangered species list in March. Environmentalists sued to overturn that decision and on Friday, U.S. District Judge Donald Molloy in Billings, Mont., restored federal protections for gray wolves in that region. Idaho, Montana and Wyoming have an estimated 2,000 wolves. Wolves are considered endangered in Washington and were never reintroduced here. Wildlife biologists have known from radio-collar transmissions that wolves sometimes roamed into Washington from Montana or Idaho, and individual wolf sightings have been reported in the state. But resident wolf breeding pairs or packs have not been confirmed. In recent years, packers made numerous reports of wolves in Okanogan County's high country, and the number of resident reports in the county's Methow Valley also grew. On July 7, biologists conducted a "howling survey" in the area in search of a wolf pack and heard both adult and juvenile howls in response. 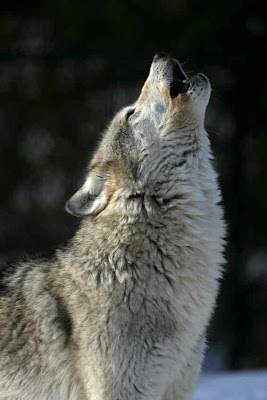 "Howling was the first step. This is the second step. The third step will be getting the DNA results," Luers said. If confirmed, the findings would be historic, she said. "The species has been gone, in terms of a reproducing animal or species, something that's actually going to build a population and be a part of our wildlife heritage again," Luers said. "That's what's exciting about this." DNA tests also could provide information about their home territory. DNA tests on an animal that was found dead on state Route 291 about 25 miles northwest of Spokane early last month showed that it was genetically similar to wolves in northwestern Montana and southern British Columbia. The tests confirmed that the animal was not a hybrid. State officials have been working with biologists, environmentalists, ranchers and other interested citizens to develop a wolf conservation and management plan. A draft is expected to be released for public comment in early 2009.